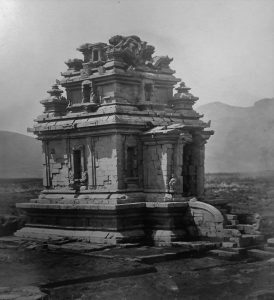 In the “Antiquities of Java” photo collection, Java’s temples and antiquities are beautifully captured in their state in the mid-19th century. Commissioned by the Batavian Society of the Arts and Sciences, and photographed by the Dutch-Flemish engaver Isidore van Kinsbergen, the collection consists of albumen prints taken between 1863 to 1874 across the island of Java, modern-day Indonesia. The series comprises primarily Hindu and Buddhist architecture and statuary from sites such as Prambanan and the Dieng Plateau. 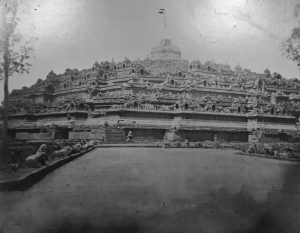 Most importantly, it includes the earliest photographic records of Borobudur, the 9th-century Buddhist monument. After Java’s ancient temples were rediscovered by Europeans during Dutch—and briefly British—colonisation, the sites drew the attention of antiquarians and scholars. The Batavian Society of the Arts and Sciences, founded in 1778, was revived by Sir Thomas Stamford Raffles, Governor-General of Java, during British rule over the island between 1811-16. After Java was restored to the Dutch, the society took more concerted effort to document and preserve the island’s Hindu and Buddhist remains. Fascinated by the new technique of albumen printing, in 1862 the society commissioned the Bruges-born engraver van Kinsbergen to photograph various archaeological sites. The collection at the Royal Asiatic Society consists of approximately 370 photographs organised into six albums. One album is dedicated to Borobudur, which was first excavated in 1814 during British occupation. These images depict the monument’s stupas, Buddha statues, and a systematic record of the relief panels on the first level of the monument. 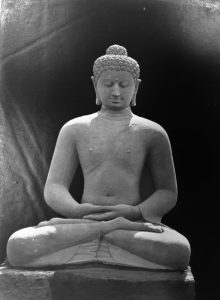 For the Buddha statues, van Kinsbergen chose to darken the background by editing the negatives, presenting them as portraits. The remaining five albums covers various sites, including the Dieng Plateau. 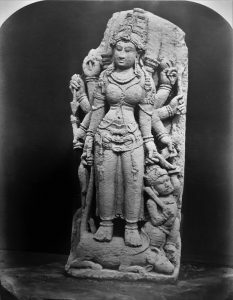 Alongside architectural shots of Hindu temples built in the 7th or 8th century, like Candi Arjuna, Candi Bima, and Candi Sembadra, van Kinsbergen also took photographs of statues of Hindu gods, as well as numerous 9th to 10th-century statues of the goddess Durga slaying the buffalo demon Mahisa. “Antiquities of Java” also captured objects like the Ciaruteun inscription, discovered in a tributary of the Cisadane river. Also known as the Ciampea inscription, it is one of seven known memorial stones bearing the name of Punawarman, King of Tarumanagara, a Hindu kingdom that ruled over West Java between the 4th to 7th century. The inscription includes an imprint of spiders and the king’s footprints, which was compared to those of Vishnu. The images, which are in the process of being catalogued, can be found on our catalogue as Photo.56 and Photo.57. For more on van Kinsbergen and his photography, see Gerda Theuns-de Boer and Saskia Asser, Isidore van Kinsbergen (1821-1905) (KITLV, Leiden, 2005).